Using cloud storages is a daily task for many of us. And that’s not something new. Think about all the E-Mail traffic which moves from cloud to cloud or the online banking where we can save templates for transactions since years. Nearly all cloud providers offer applications for computers and mobile devices for managing the data. Although big companies are engaged in cloud computing the offered client apps are still not yet fully developed. If we talk about a Post PC era companies need to enable the era to take place. As users are increasingly sophisticated in their needs embryonic software will not have a chance. The time is over where a mobile devices are just seen as a gadgets. So let’s have a look on the features of so-called Client Apps with which we can access our free or paid cloud account directly in two directions, from and to the device. I want to discuss offers from Google, Dropbox, iDriveSync, Box, SugarSync, SkyDrive, and Wuala. Keep in mind that this article is just about clients for Apple’s mobiles and when it comes to a rating it’s solely the offered client app for iOS which is taken into account. These apps, I call them native apps, are designed for solely accessing to cloud storage. Another category of apps also provides access to clouds e.g. Documents by Readdle. These apps are usually called File Management apps. It’s obvious that all the above mentioned providers offer client apps for computers for syncing data in the cloud with data on a local harddrive. What should we expect from client software on iOS devices? See these screenshots to get an impression of the different user interfaces. 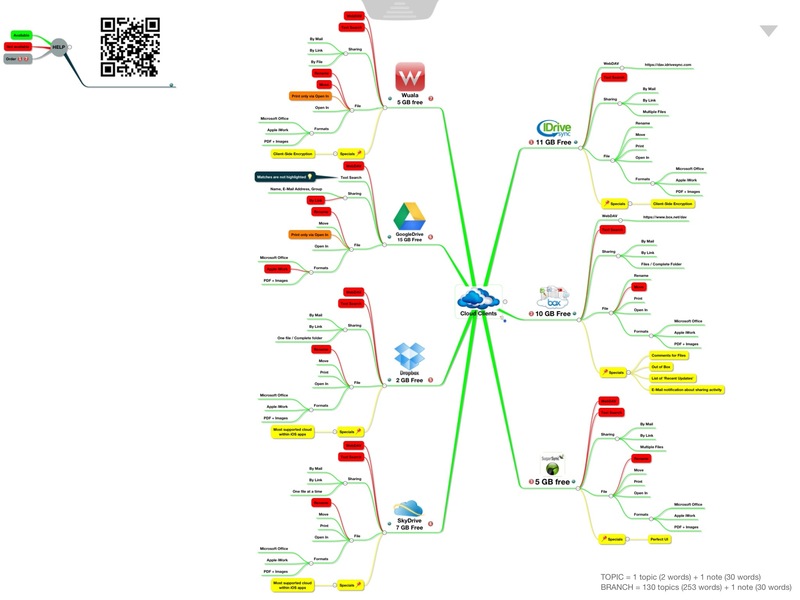 Here is a mind map showing whether main functionalities of client apps for Apple’s mobiles are available or not (red). App updates released after mid of July might change feature descriptions. to see and download more mind maps related to Apple, products for Apple devices like database clients or mind mapping tools, and background information about the company. From my point of view the winner is Box with overall excellent features. Just a full text search is not available. Furthermore Box offers 10 GB free space. With the offered WebDAV access Apple’s iWork suite can directly connect to Box’s cloud storage. If there is a need for more security iDriveSync with it’s client-side encryption is recommended. That means, solely you have the key to decrypt. Even if government comes knocking at iDriveSync’s door there is no way to decrypt your data (says the company). There seems to be no need for native clients as they mostly do not meet the above mentioned requirements. Anyway it’s recommended to install clients for those providers you registered with, because it cannot be excluded that apps for file management are flawed. In this case it’s useful to access the storage with the help of a native app of your provider. To increase usability the additional installation of one or more file management apps is indispensable.